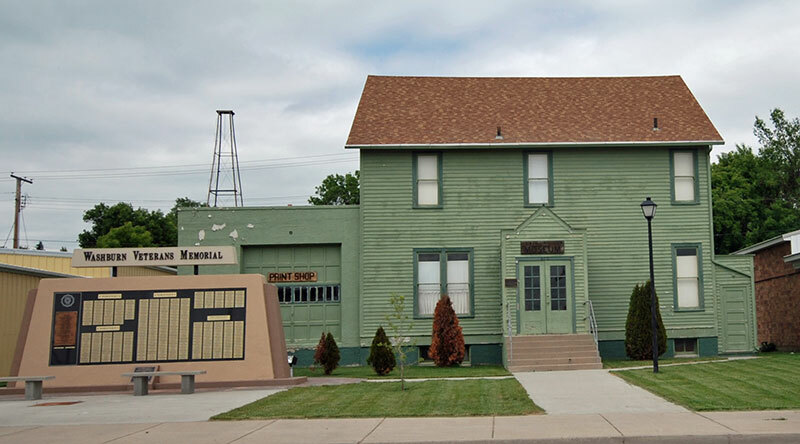 The first courthouse buildings in North Dakota were either spaces found in existing buildings or small, quickly erected wood buildings. 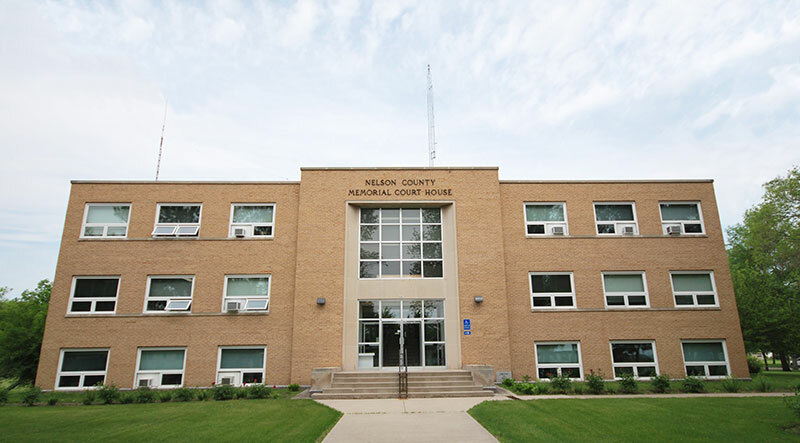 As the county seats became more established, larger and more permanent courthouses were constructed, in part to help settle calls for moving the seats to other communities. Early courthouses are a symbol of strength and pride that can be seen in their design. The population of North Dakota continued to grow steadily until the 1920s and then saw a consistent decline until 2008. While the overall population declined, some towns grew as the rural population also migrated into towns. This migration of the population led to a need for more government space, especially after World War II, and resulted in several new courthouses being built in the 1950s and 1960s. Since that time, some counties have opted to push for new courthouses but several have chosen to pursue additions in order to preserve their heritage while still meeting current needs. 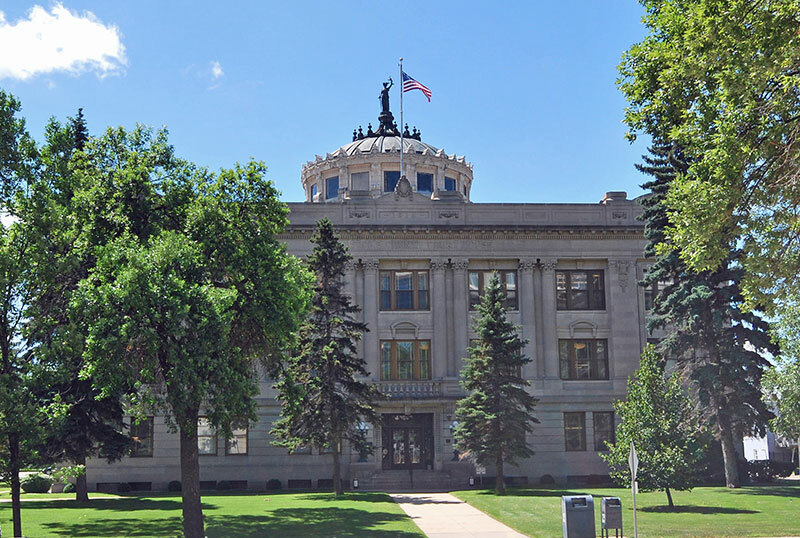 Featured below are the historic current and former courthouses in North Dakota from: Adams, Barnes, Benson, Billings, Burke, Burleigh, Cass, Dickey, Divide, Eddy, Emmons, Foster, Golden Valley, Grand Forks, Griggs, Hettinger, Kidder, LaMoure, McHenry, McIntosh, McLean, Mountrail, Nelson, Pembina, Pierce, Ramsey, Ransom, Renville, Richland, Rolette, Sargent, Sheridan, Stark, Steele, Stutsman, Towner, Traill, Walsh, Ward, Wells, and Williams Counties. 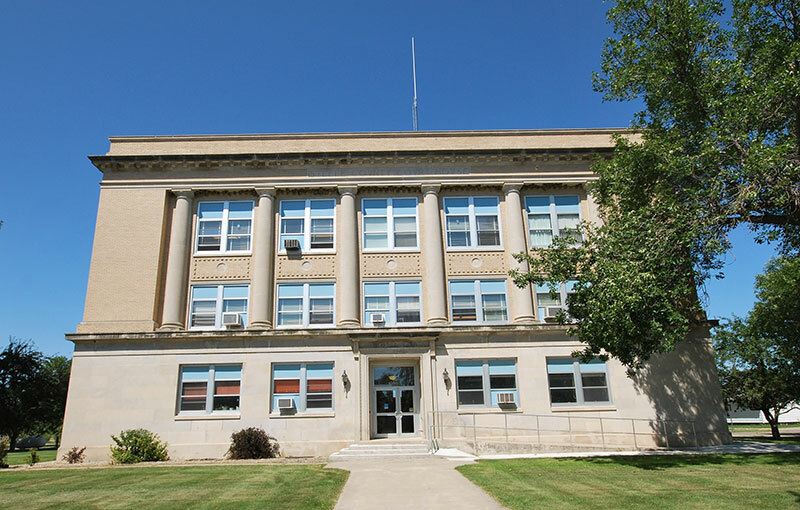 The exception is Logan County Courthouse, which at the time of the site visit had not remedied changes made in violation of NDCC 55-02-07. Also included is a list of courthouses that are less than 50 years old and a link to federal courthouses. 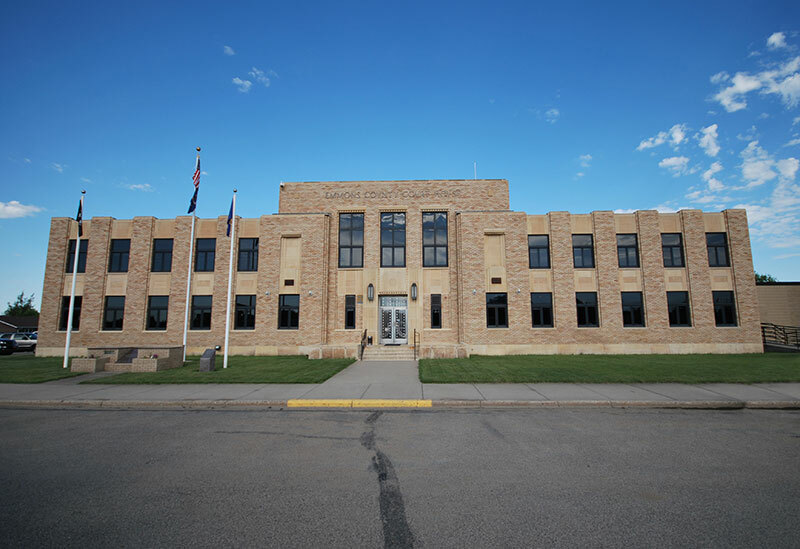 The courthouse built for Adams County in 1928 was designed by Ira Rush, a leading architect in North Dakota at the time and built by Fred R. Comb. Rush scaled back his original design to meet budget concerns but still infused Art Deco ideas into the older federal revival style. The earlier courthouse became the sheriff's residence until it was replaced in the 1960s. This courthouse was listed in the National Register of Historic Places in 1985 as part of a thematic nomination. Barnes County employed the architecture firm of Toltz, King, and Day for its 1925 Neo-Classical courthouse. 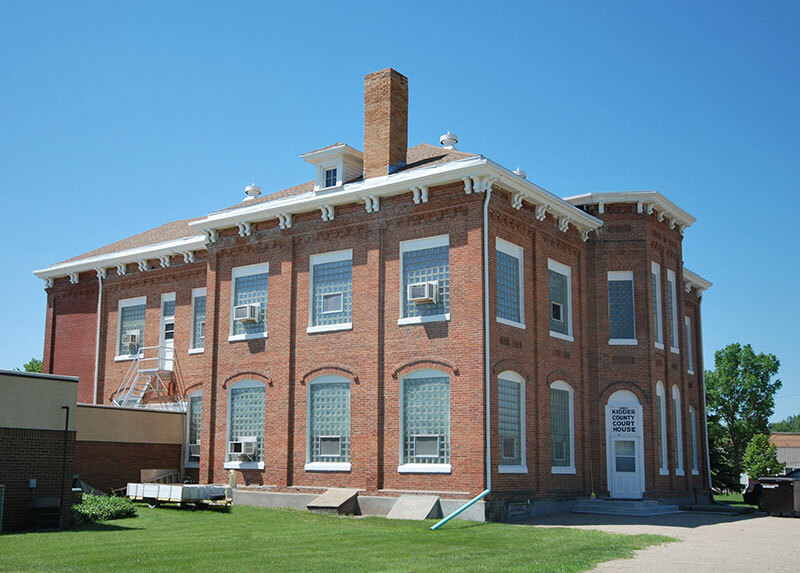 This was the first of three courthouses in North Dakota built by this Minnesota firm. The builders for this courthouse were the Butler Brothers. This courthouse was listed in the National Register of Historic Places in 1985 as part of a thematic nomination. 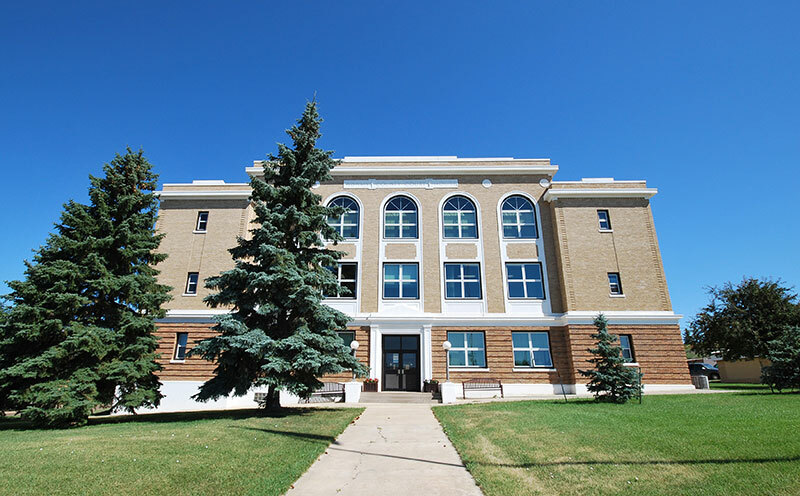 This is the second courthouse in North Dakota designed by Toltz, King and Day and the first known to be built by Olson and Orheim. Built in 1928, the design was inspired by the American Federalist style. An addition is currently being planned. This courthouse was listed in the National Register of Historic Places in 1985 as part of a thematic nomination. 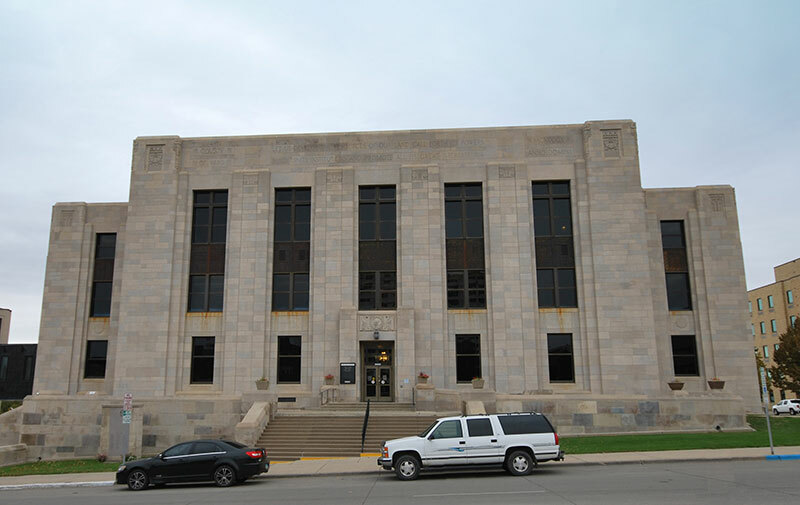 The county courthouse in the capital city of North Dakota was designed by Ira Rush and built by Redlinger & Hansen in 1931.The outside was done in the Art Deco style and the inside was decorated with numerous paintings and murals, including ones by local artist, Clell Gannon. This courthouse was listed in the National Register of Historic Places in 1985 as part of a thematic nomination. 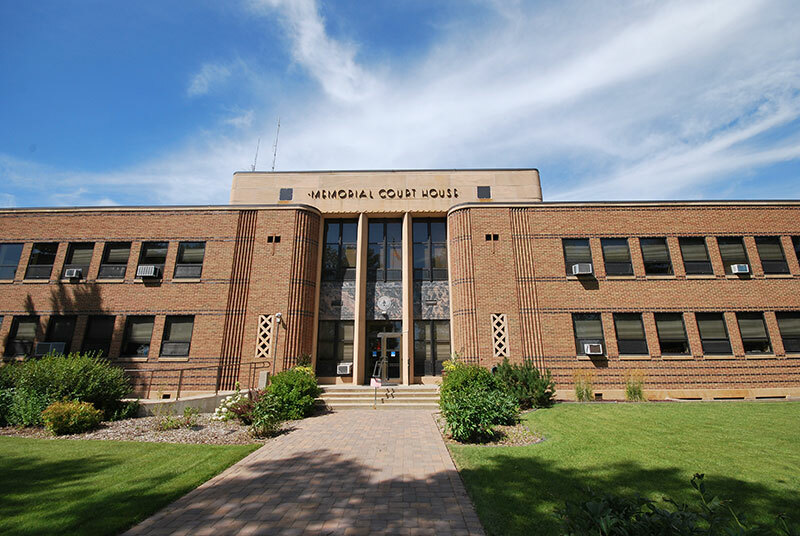 Several new courthouses were built in the 1950s-1960s as county seats grew with the migration of rural residents into towns. The Cavalier County Courthouse was designed by Foss and Co. and built in 1957. This one-story building incorporates the ideas of Mid-Century Modern architecture. This courthouse has not yet been nominated for the National Register of Historic Places. 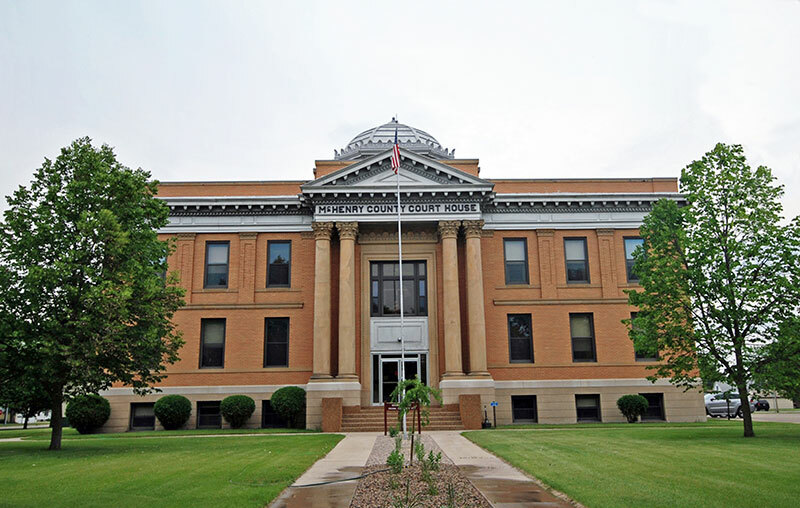 Designed by Buechner & Orth and built in 1910, the Dickey County Courthouse closely resembles the Traill County courthouse with exception of the paired columns on the dome tower and single dentiled pilasters between the second story windows. This courthouse was listed in the National Register of Historic Places in 1980 as part of a thematic nomination. 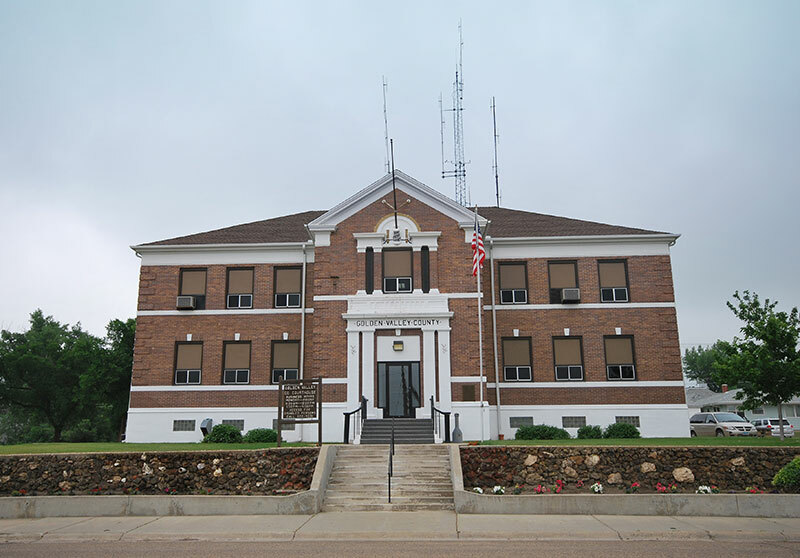 Designed by Buechner & Orth and built in 1917, this is the only North Dakota courthouse they designed that is on the main street of town. The large murals in the dome feature scenes from early local history. This courthouse was listed in the National Register of Historic Places in 1980 as part of a thematic nomination. 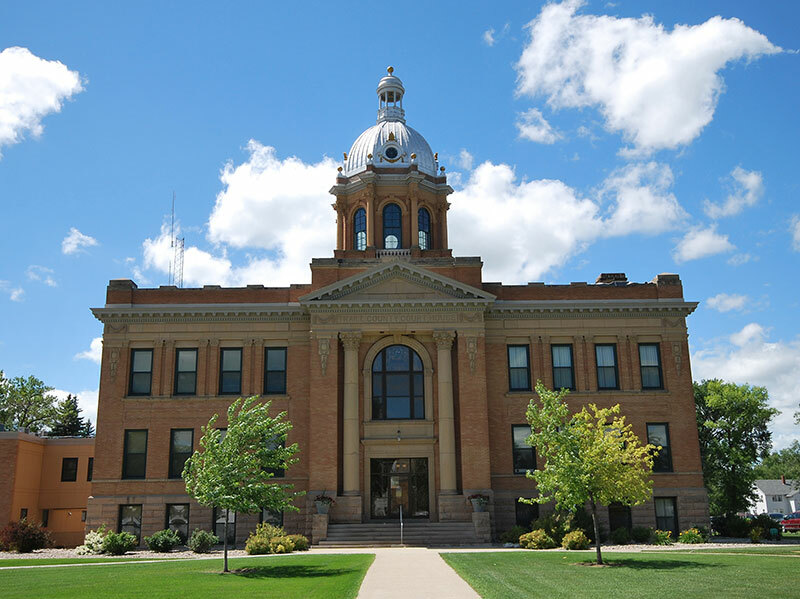 This 1899 courthouse was designed by Milton E. Beebe, an architect who moved to Fargo, ND from Buffalo New York in 1898. Built by M.J. Moran, the Eddy County Courthouse has a distinct tower centered above the entrance and continues to be one of the largest buildings in the area. This courthouse was listed in the National Register of Historic Places in 1985 as part of a thematic nomination. 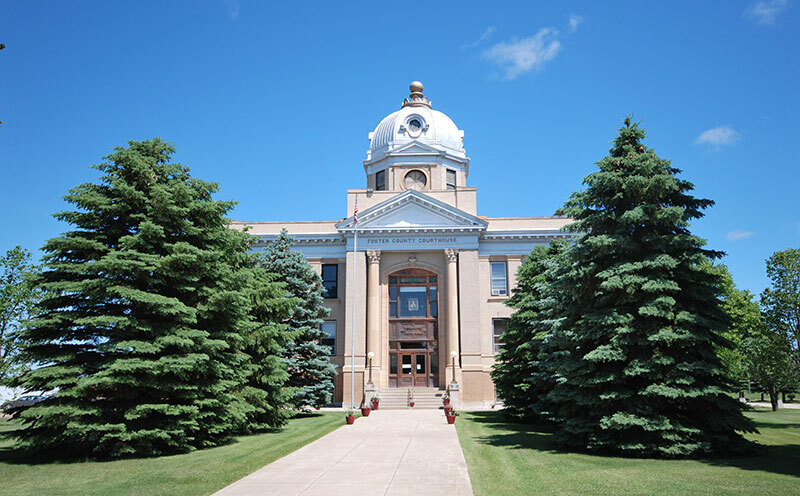 The Emmons County Courthouse was designed by J. Howard Ness and built by Olson and Orheim in 1934. 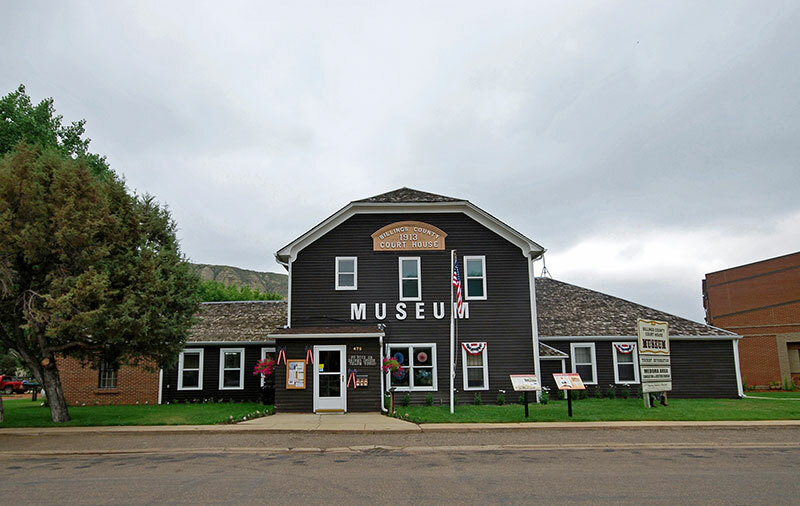 It was the first project in North Dakota to be funded by the Works Progress Administration (WPA) and demonstrated how communities could benefit from the federal aid. This courthouse was listed in the National Register of Historic Places in 1985 as part of a thematic nomination. Designed by Buechner & Orth and built in 1909, this courthouse, like the others, has some BeauxArts Neo-Classical style details. Plans for a project on the tall dome are currently being considered. This courthouse was listed in the National Register of Historic Places in 1980 as part of a thematic nomination. 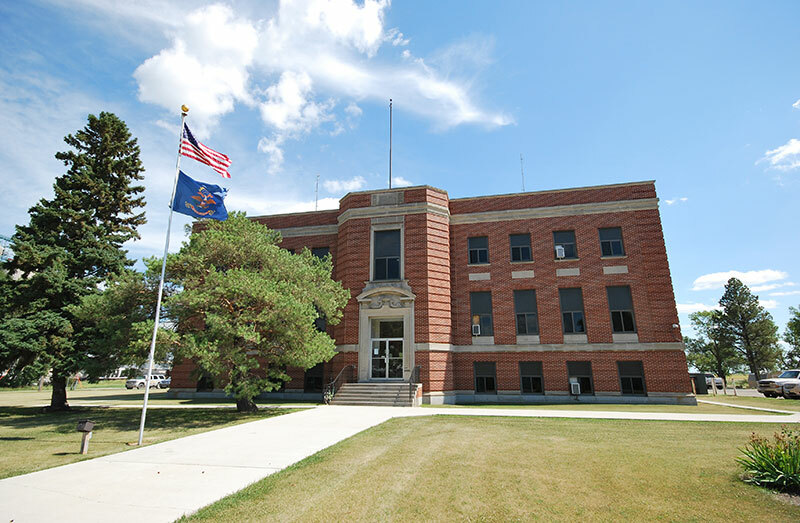 Golden Valley Courthouse has the distinction of being the only courthouse in North Dakota designed by an architect from Montana, W.E. Deitrich. Designed in a Federalist revival style the building uses simpler details than is seen in many other courthouses. A.J. Weinberger built this courthouse in 1923. This courthouse was listed in the National Register of Historic Places in 1985 as part of a thematic nomination. 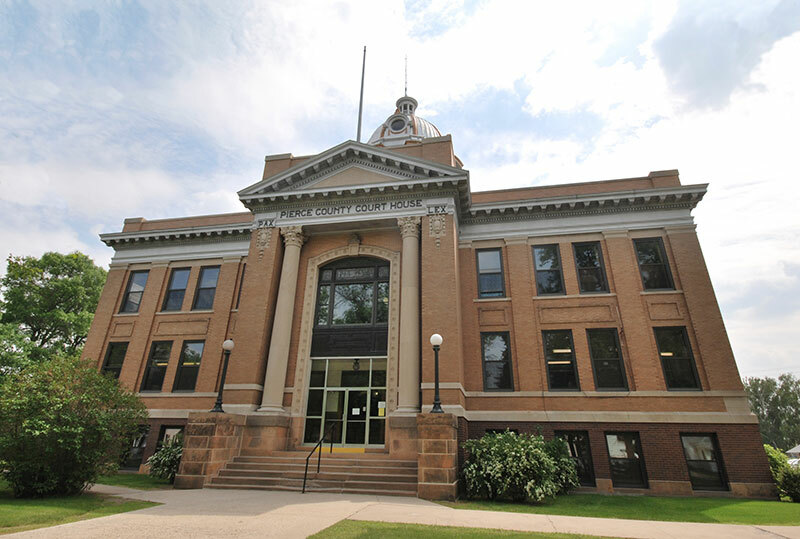 The Grand Forks County Courthouse, built in 1913, is the largest and most expensive one designed by Buechner & Orth in North Dakota. It is covered with limestone and is of a more classical design and does not have a projecting central pavilion. This courthouse was listed in the National Register of Historic Places in 1980 as part of a thematic nomination. 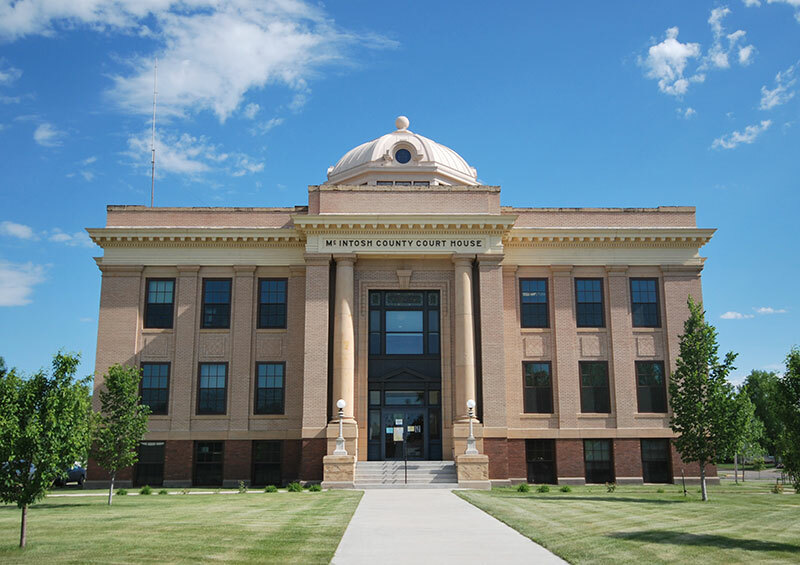 The bond to build the Hettinger County Courthouse narrowly passed in 1934 after failing in several previous elections over two years. Part of the vote, this time, included taking advantage of Public Works Administration (PWA) funds. The grant allowed the Ritterbush Brothers' Art Deco design to be built by A.J. Weinberger by 1936. This courthouse was listed in the National Register of Historic Places in 1985 as part of a thematic nomination. Kidder County Courthouse is actually the oldest building serving as a courthouse in North Dakota but it was originally designed to be a hotel. This 1883 Italianate building was funded by Wilbur F. Steele in hopes of winning the relocation of the territory capital. When that effort failed, Steele used his position as chairman of the county commission to sell the idea of converting it to a courthouse in 1884. This courthouse was listed in the National Register of Historic Places in 1985 as part of a thematic nomination. 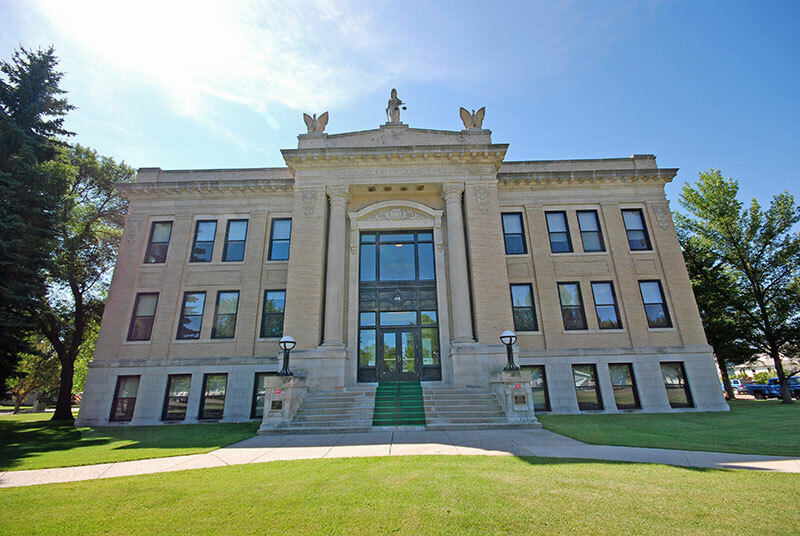 LaMoure County commissioned Buechner & Orth to design their courthouse in 1907 but did not build it until 1909. 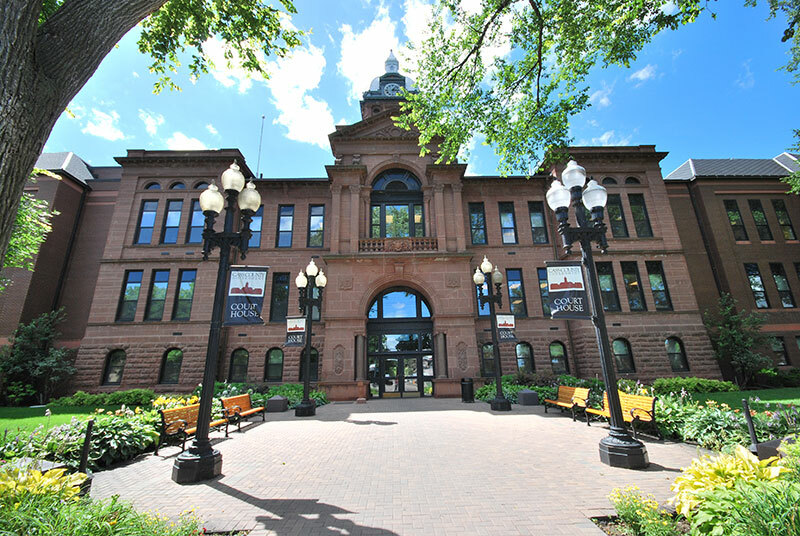 It is constructed with concrete, brick, and sandstone like several other of its sister courthouses. This courthouse was listed in the National Register of Historic Places in 1980 as part of a thematic nomination. 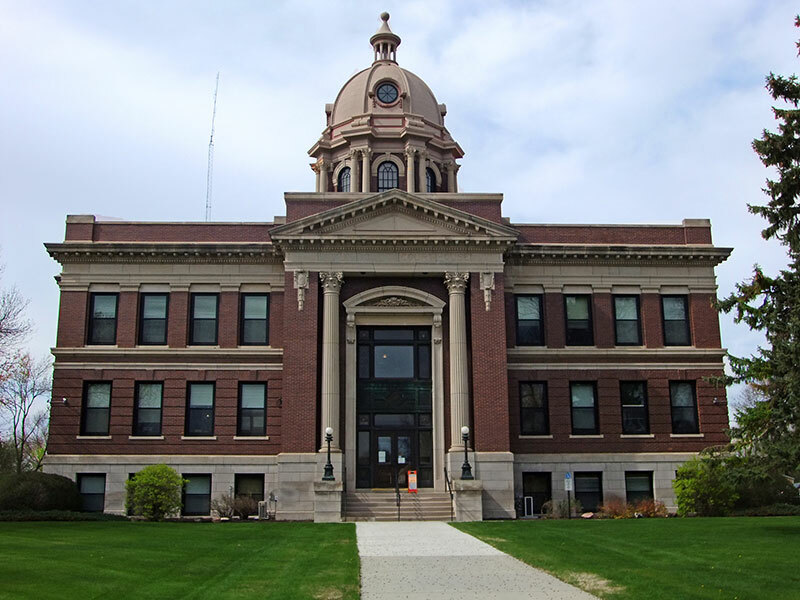 Built in 1907, this was the second of the 13 courthouses designed by Beuchner & Orth in North Dakota. 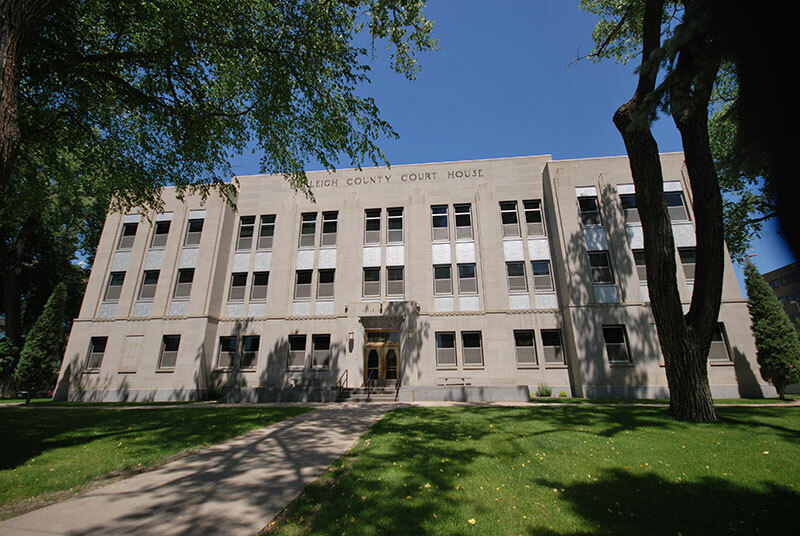 This courthouse is simpler, more economical version of the Traill County Courthouse. This courthouse was listed in the National Register of Historic Places in 1980 as part of a thematic nomination. 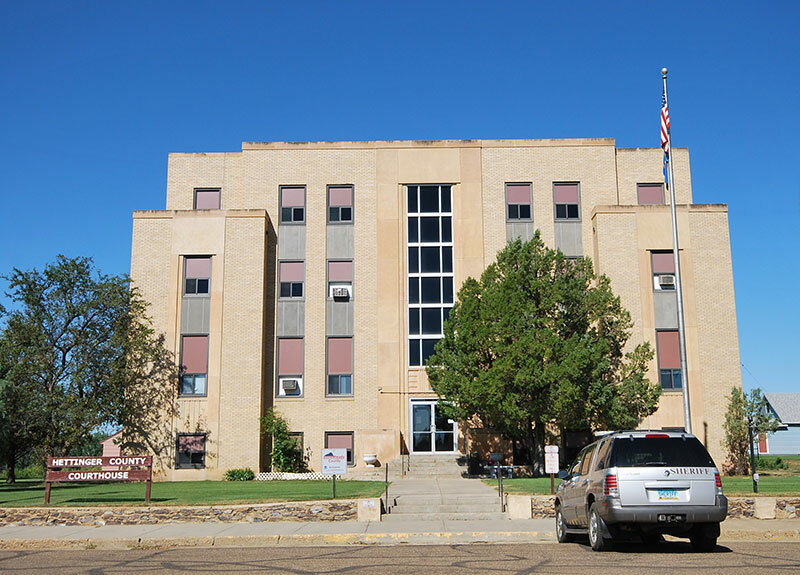 Built in 1919, McIntosh County courthouse was the last one designed by Buechner & Orth in North Dakota. 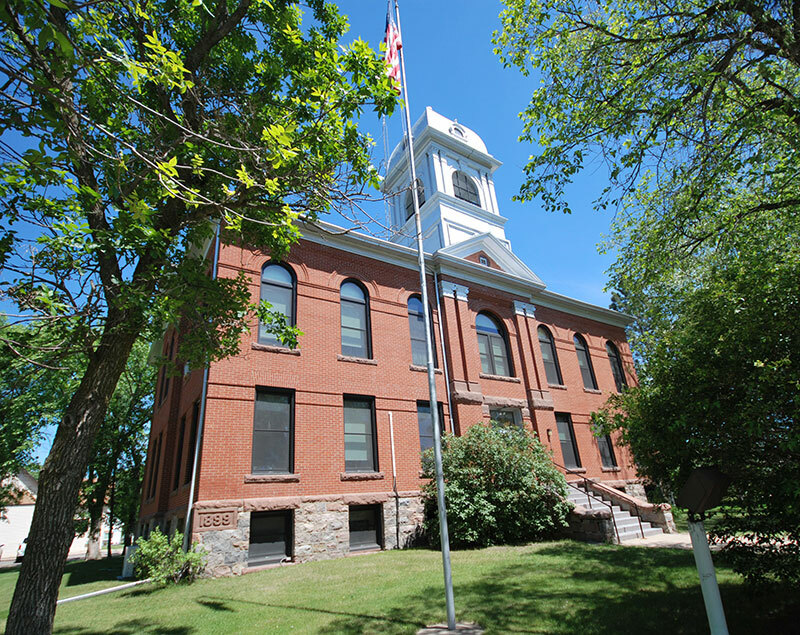 It has the standard plan shared by most of the others but used a more frugal and simple approach and is nearly identical on the exterior to the Sargent County courthouse. This courthouse was listed in the National Register of Historic Places in 1980 as part of a thematic nomination. This former courthouse for McLean County was built in 1905 after the original one burned. It was replaced with a larger brick and stone courthouse in 1917. The 1917 courthouse served the community until 2014 when it was demolished after a lengthy battle within the community. This courthouse was listed in the National Register of Historic Places in 1985 as part of a thematic nomination. 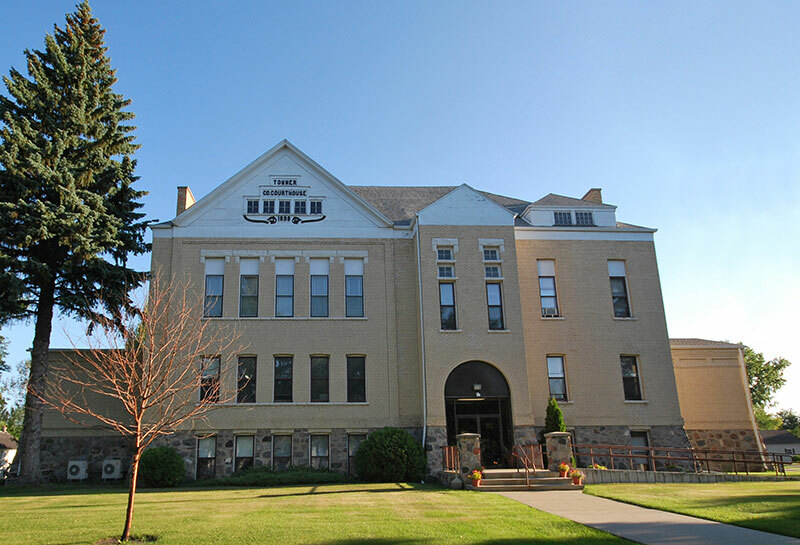 Built in 1914, the Mountrail County Courthouse is more like the earlier Buechner & Orth courthouses than the more recent Grand Forks County Courthouse. 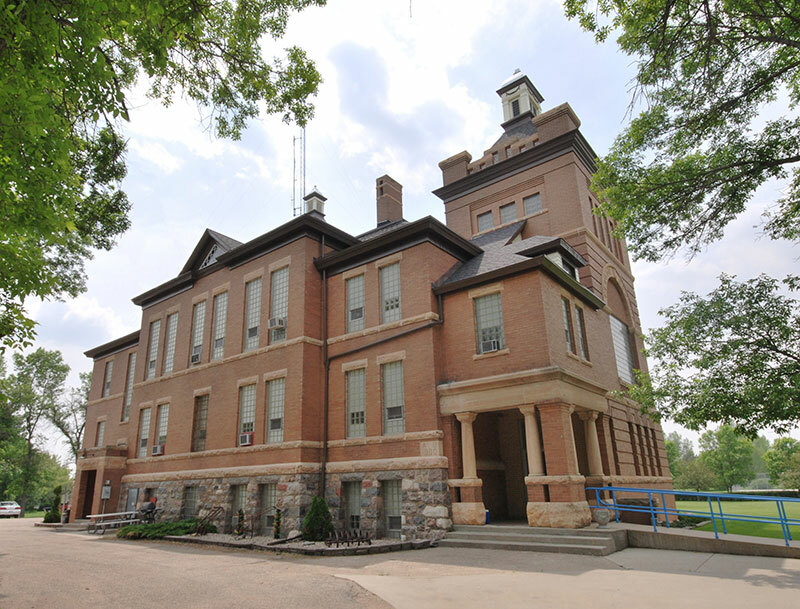 It is primarily covered in Hebron brick and Kettle River stone but its dome has a lower arc than the others. This courthouse was listed in the National Register of Historic Places in 1980 as part of a thematic nomination. The previous Nelson County Courthouse had been built in 1885. Due to changes in the county population, service needs, and the desire for modern amenities, this courthouse was built in 1951. This mid-century courthouse has not yet been nominated for the National Register of Historic Places. Built in 1912, this is the only courthouse designed by Buechner & Orth to not have a central dome. To emphasize the height of the central entrance, they used statuary instead. This courthouse was listed in the National Register of Historic Places in 1980 as part of a thematic nomination. 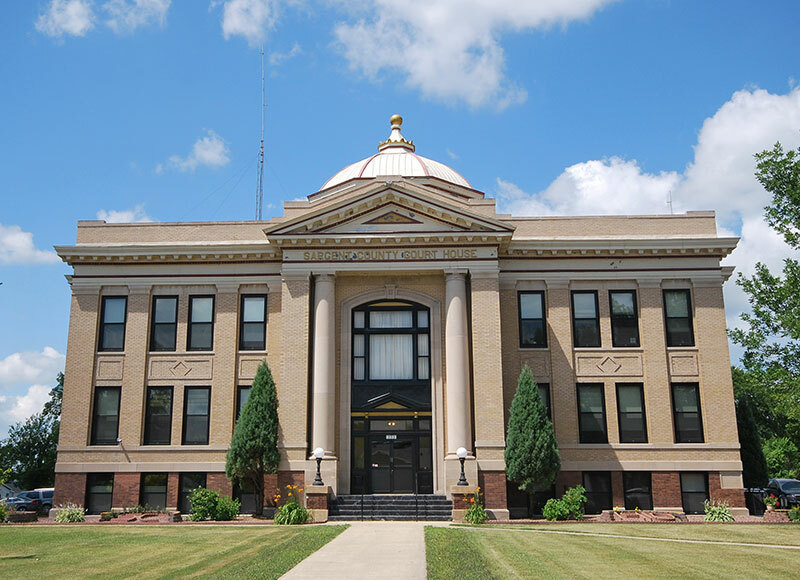 The Pierce County Courthouse, built in 1908, was the first Buechner & Orth courthouse in North Dakota to use chocloate brown stone at the foundation with lighter brick walls. This courthouse was listed in the National Register of Historic Places in 1980 as part of a thematic nomination. The 1960 Ramsey County Courthouse was built on the same site as the previous courthouse after it was decided more space was needed. The new courthouse was designed by Foss and Co. and built by John Larson and Company for $900,000. This courthouse has not yet been nominated for the National Register of Historic Places. 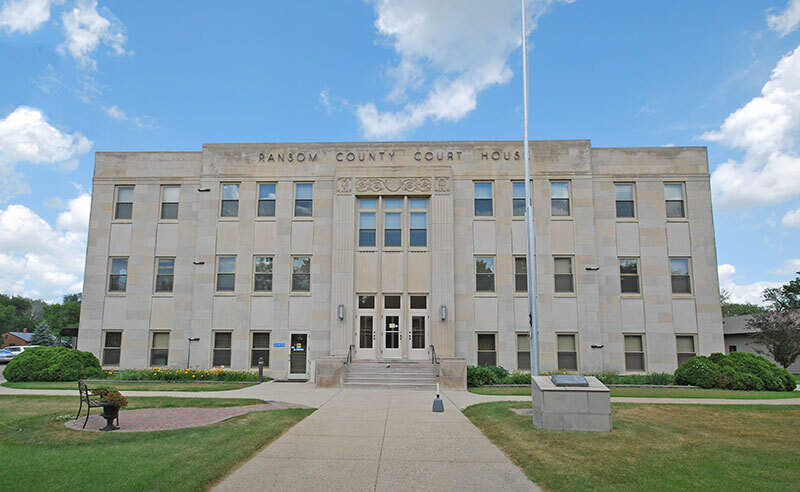 The bond to construct this courthouse in Ransom County failed twice in 1935 when an effort was made by some residents to try to move the county seat to Enderlin. After the relocation effort failed, a bond was passed in 1937 to build a courthouse and it was designed by Ira Rush with permanence in mind. This Works Progress Administration (WPA) project, along with a construction boom helped lift the county out of depression. This courthouse was listed in the National Register of Historic Places in 1985 as part of a thematic nomination. This 1936 courthouse designed by Edwin A. Molander, engineered by C.H. Ording, and built by I.E. Orheim was funded in part by the Works Progress Administration (WPA). 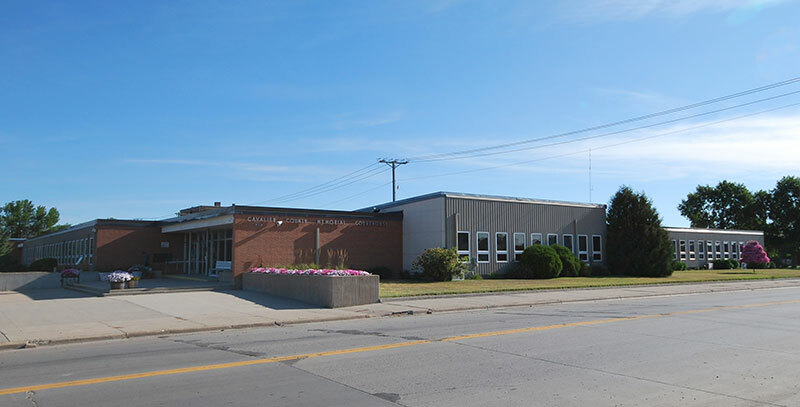 The Renville County Courthouse is the only one in North Dakota that could be considered to have Art Moderne styling. This courthouse was listed in the National Register of Historic Places in 1985 as part of a thematic nomination. 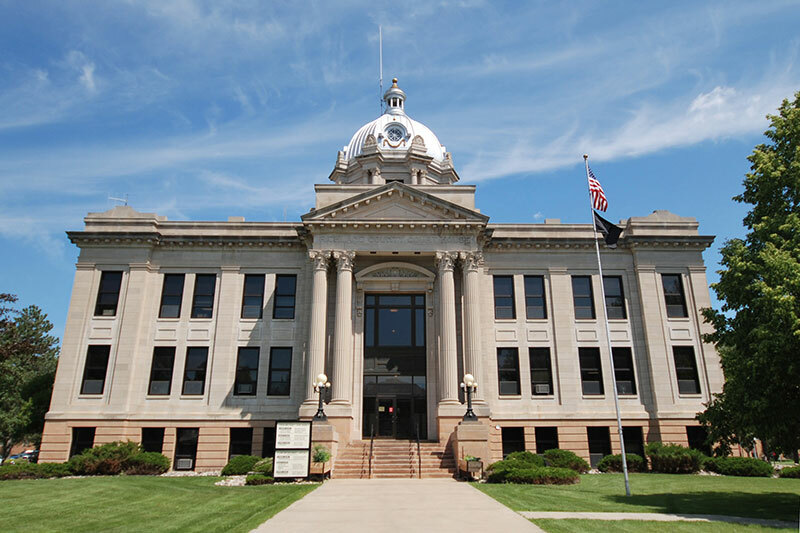 Designed by Buechner & Orth and built in 1912, this courthouse uses marble on the interior but has white marble rather than the variety of colors used in the other courthouses. This courthouse was listed in the National Register of Historic Places in 1980 as part of a thematic nomination. 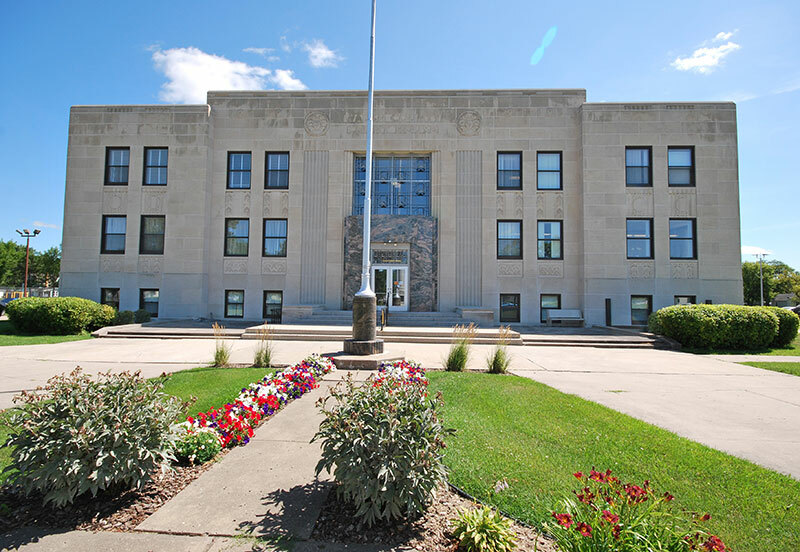 The Rolette County Courthouse is also a World War II Memorial building that was built in front of the old courthouse in 1959 with a low bid of $111,198. The older courthouse served as Social Services offices until it was razed in 1971. This courthouse has not yet been nominated for the National Register of Historic Places. 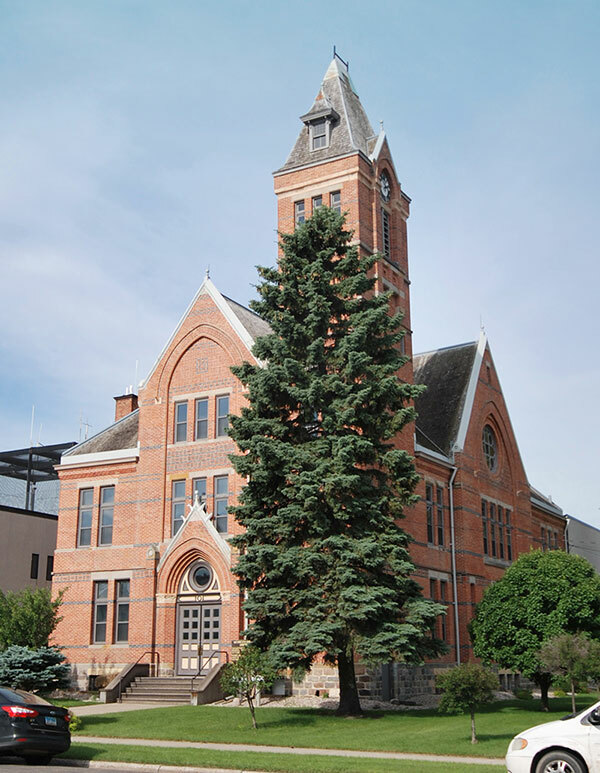 Designed by Buechner & Orth and built in 1910, the Sargent County Courthouse is an ecomonical version of the Foster and Pierce County Courthouses. The economical approach is seen in the use of Doric columns instead of ones from a more ornate order and the lack of stained glass. This courthouse was listed in the National Register of Historic Places in 1980 as part of a thematic nomination. Ira Rush designed the Sheridan County Courthouse and P.H. Schwarts supervised its construction in 1939. 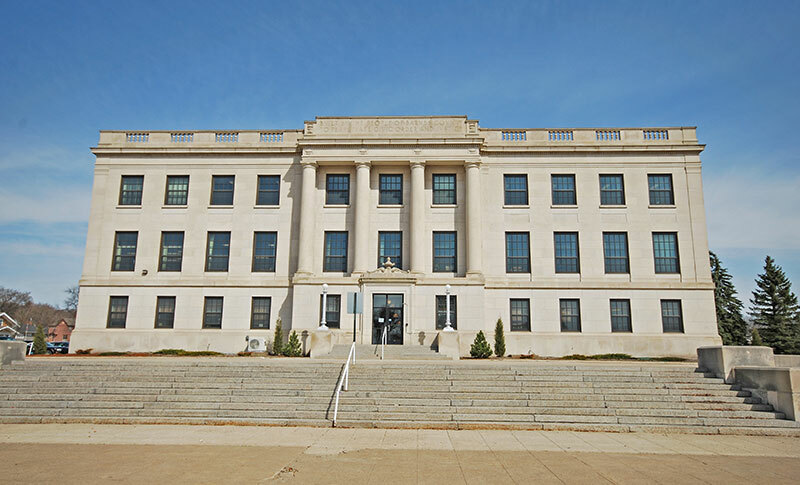 This courthouse is the strongest example of Art Deco among the courthouses and is the only Works Progress Administration (WPA) project within the state to be built of monolithic concrete. Unfortunately, round aggregate used in the concrete has popped out creating a pock-marked facade. This courthouse was listed in the National Register of Historic Places in 1985 as part of a thematic nomination. 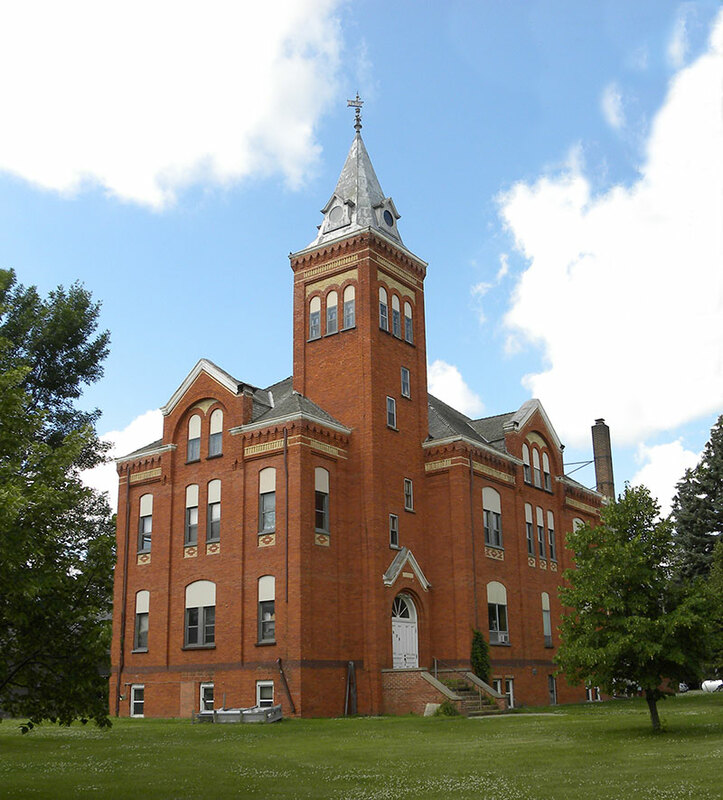 The Stark County Courthouse was designed by William F. Kurke of Fargo and built by S.W. Jonason Company in 1937. 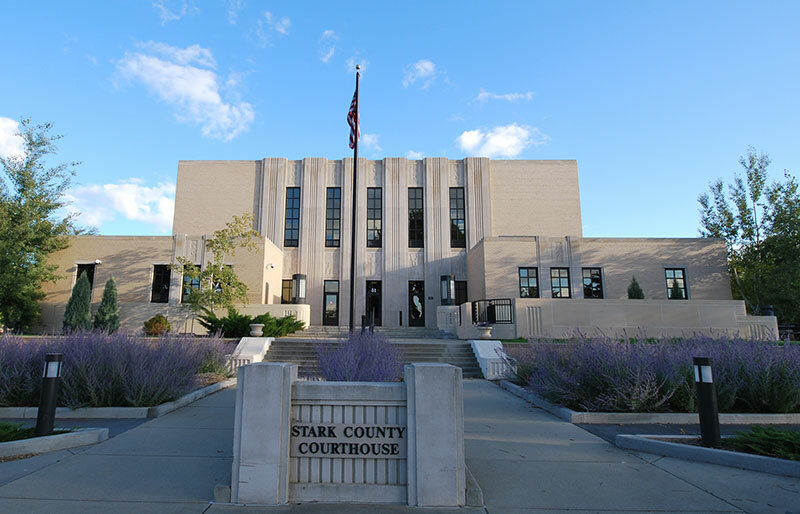 The courthouse was funded in part by the Public Works Administration (PWA) the courthouse accounted for nearly half of the construction in Stark County in the 1930s. A new ramp in front of the courthouse was finished last year and an addition is currently being planned. This courthouse was listed in the National Register of Historic Places in 1985 as part of a thematic nomination. 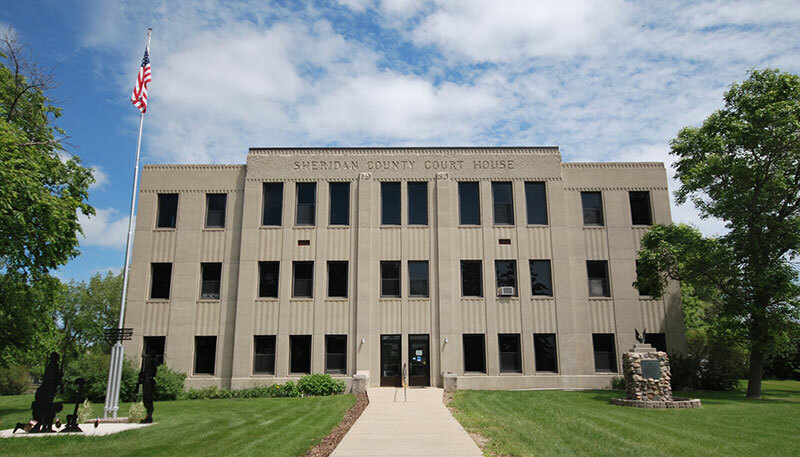 Residents of Steele County argued over governance in the 1920s and forced litigation to keep the county from building a new courthouse so they could be absorbed into neighboring counties. The litigation failed and in 1925 the County had T. Ostby and Son build the classically influenced courthouse designed by Braseth and Houkom. This courthouse was listed in the National Register of Historic Places in 1985 as part of a thematic nomination. A.J. 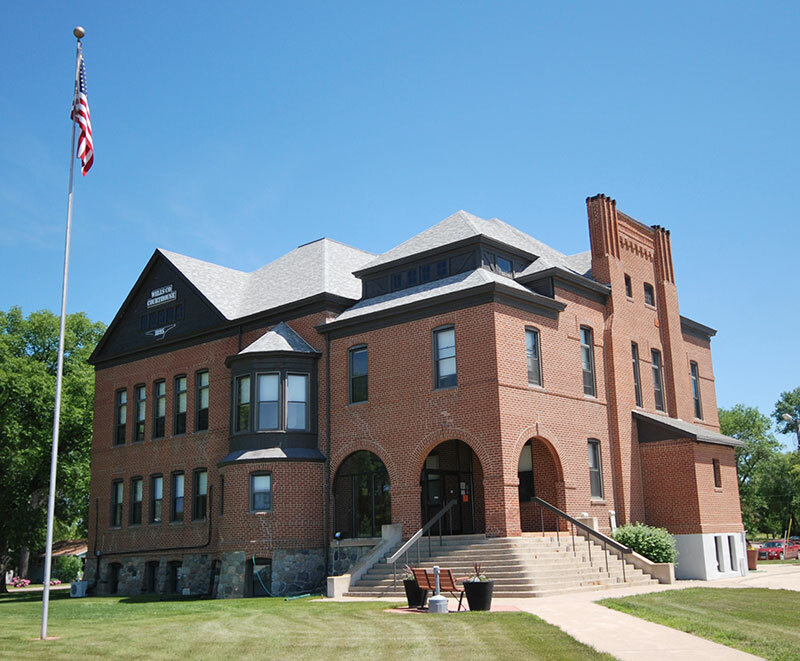 O'Shea used elements of the Queen Anne style to add details to the Towner County Courthouse that was built in 1898 by Watterwoth Fee. Originally, the small gable over the entrance was actually a bell tower but it was converted to this look by 1959. This courthouse was listed in the National Register of Historic Places in 1985 as part of a thematic nomination. 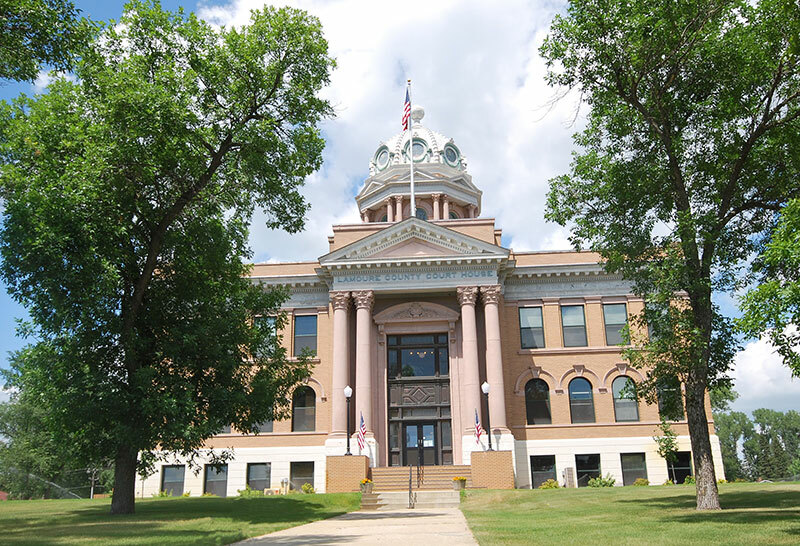 Designed by Buechner & Orth and built in 1905, this was the first of 13 county courthouses the St. Paul, Minnesota firm built in North Dakota. Like most of the other 13, it has a central metal dome to allow light down into the highly decorated atrium. This courthouse was listed in the National Register of Historic Places in 1980 as part of a thematic nomination. 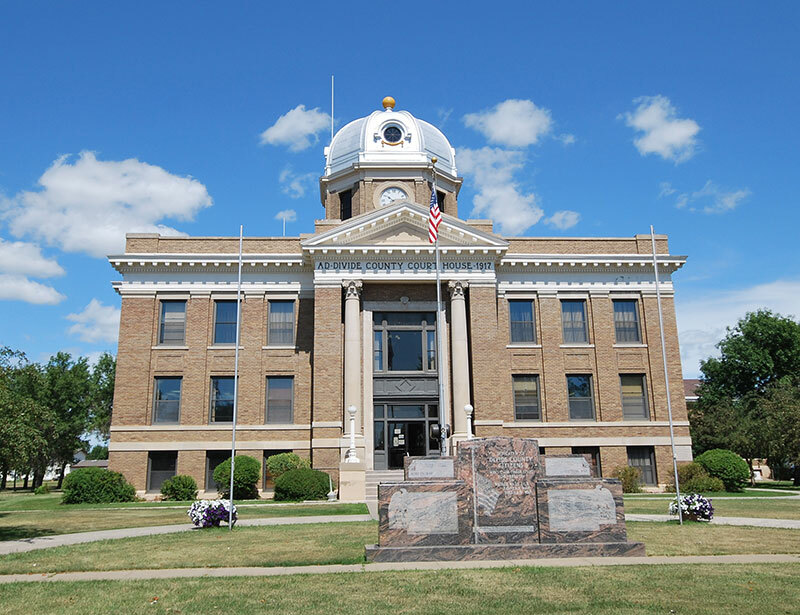 While Walsh County residents agreed for the most part on the need for a new courthouse, they disagreed on size, cost, and financing. While some wanted to use federal relief funds, others distrusted the government programs and ultimately, a bond was passed to fund the courthouse localy in 1938. Theodore B. Wells designed the building and Johnson and Gilanders completed the construction in 1940. This courthouse was listed in the National Register of Historic Places in 1985 as part of a thematic nomination. 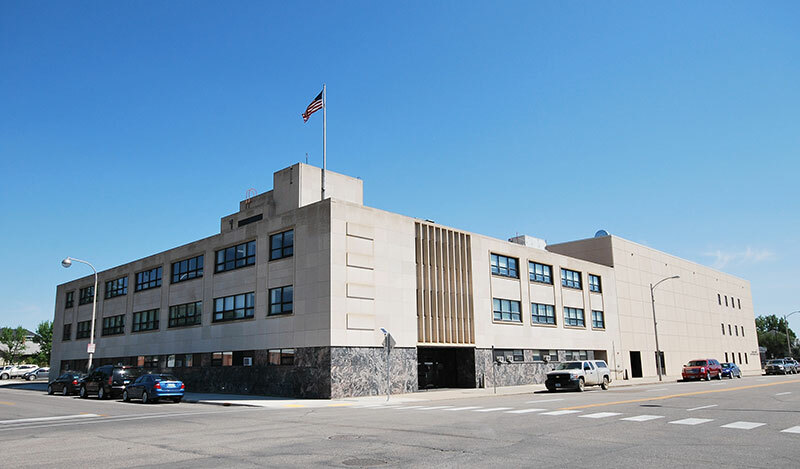 The Ward County Courthouse is the first one in North Dakota to be built with Art Deco/Art Moderne inspiration. It was designed by Toltz, King, and Day and constructed by Olson and Orheim in 1929 for a cost of $498,000. 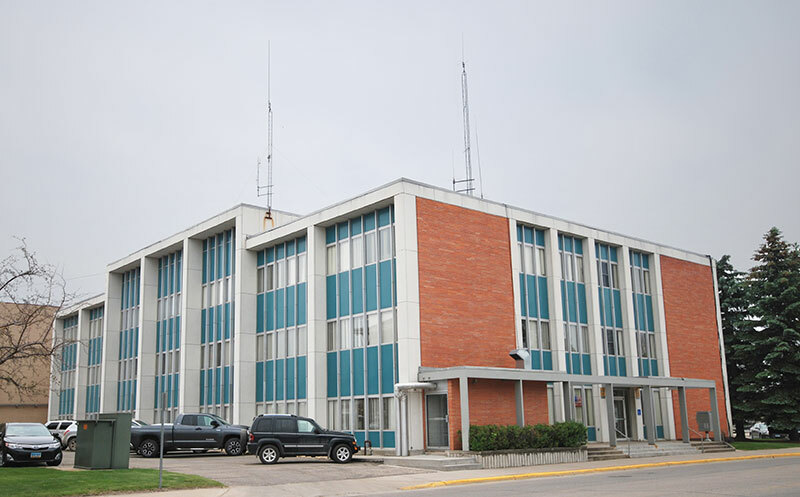 The courthouse was recently connected to a new building to the north and will see some renovations as the offices inside are reorganized. This courthouse was listed in the National Register of Historic Places in 1985 as part of a thematic nomination. 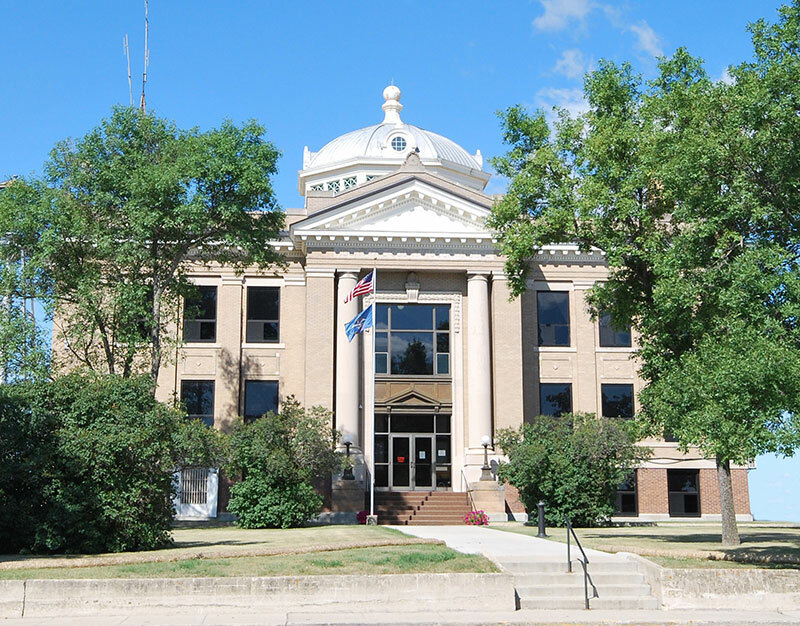 Starting in 1929, Williams County looked for financing for a new courthouse. After many years of attempts and controversy, it approved a courthouse in 1949. William F. Kurke turned in his first design in 1950 but an oil boom caused the commissioners request a larger design for the building. After more controversy regarding cost and the new location, this courthouse was finally built in 1953 . This courthouse has not yet been nominated for the National Register of Historic Places.